Members of the winning moot court team from the University of Georgia School of Law and the judges who named them national champions are: Judge Andrew M. Edison, United States Magistrate Judge for the Southern District of Texas, left; Judge Jennifer Walker Elrod of the U.S Court of Appeals for the Fifth Circuit; Georgia team members Thomas Grantham and Timia Skelton; Judge James E. Graves, Jr., of the U.S Court of Appeals for the Fifth Circuit; Georgia team member Simone Ford; Justice Jeff Brown of the Texas Supreme Court; Justice Scott A. Brister of the Texas Supreme Court (ret.). 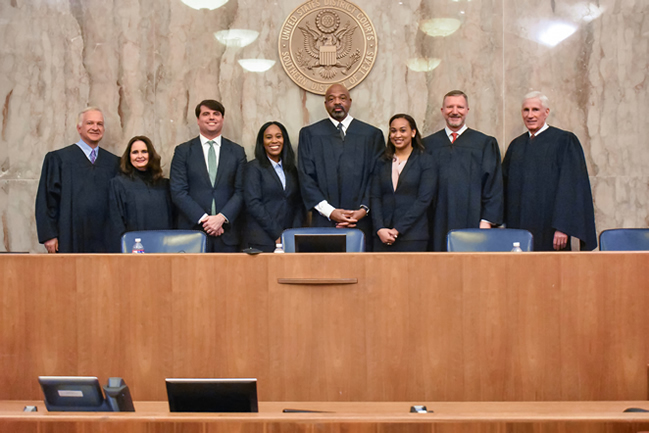 Feb. 4, 2019 — The team from the University of Georgia School of Law out-argued the nation's best student advocates to claim the winner's trophy in the 11th annual Hunton Andrews Kurth Moot Court National Championship hosted recently by the Blakely Advocacy Institute of the University of Houston Law Center. The Georgia team of Thomas Grantham, Timia Skelton and Simone Ford outperformed the team from William & Mary Law School to claim top honors in the three-day competition. The tournament drew the nation's 16 top moot court programs to Houston based on a point-system for their showings in tournaments throughout the previous school year. Katherine Berger, from Ohio State University Moritz College of Law, received the Newell H. Blakely Best Speaker award. "The championship is a true test of a team's excellence" said Jim Lawrence, executive director of the Blakely Advocacy Institute. "Students know that when they compete in the championship, every team will be performing at a high level." Student lawyers used their training to argue both sides of a hypothetical case involving the 2nd Amendment — specifically whether the right to sell firearms is secured under the Amendment. Their courtroom skills were evaluated by volunteer state and federal judges, practicing attorneys and local academics. In addition to the law firm of Hunton Andrews Kurth LLP, the Blakely Advocacy Institute, and the University of Houston Law Center, the competition was co-sponsored by the UH Law Alumni Association, Dentons for Best Brief, McDowell Hetherington LLP, and John Shely for Best Oral Advocate. The Jan. 24–26 event opened with a symposium — "The Second Amendment: Where the Rubber Meets the Road" — which took a broader look at the competition's specific "problem" by discussing the 2nd Amendment, its history, practical impact on individuals and states, and how government entities are dealing with gun rights. Speakers included Donald Kilmer, a gun rights attorney who has argued several influential 2nd Amendment cases; Madie Lake, executive director of March for Our Lives Houston and a high school student gun-control advocate; Rhonda Hart, the mother of a deceased Santa Fe high school shooting victim; and Mike Knox, a Houston city councilman/former Houston police officer.